The Oak Cliff Film Festival organizers have a special place in their hearts for cyclists. They’ve put together quite a line-up June 14-17th and they’re offering cyclist discounts. For those of you who plan to make it a weekend-long biking affair, you’re entitled to half-price festival badges (use password f4iend50f0akclifffilmfest). You can park blocks away and bike up or bike from home, but you make your scouts honor pledge to help relieve parking woes and receive your thank-you gift in advance. If you’re inclined to see just a film or few, ride your bike to the box office and receive a 50% discount. That’s $5 off the $10 ticket! Films showing at: Texas Theatre, Kessler Theatre, Bishop Arts Theatre, The Belmont, Oil & Cotton, El Sibil, the Turner House and the Dallas Zoo. See the full line-up. And the über-special cyclist part of the weekend, you ask? There are two! BFOC will be hosting the On the Trail of Lee Harvey Oswald group ride Saturday the 16th Sunday the 17th. Full details coming soon, but I’m pretty sure I overhead the ride will end at the zoo’s 8pm showing of Fantastic Mr Fox. (I’m counting on it – the film’s showing in the middle of the big cats exhibits!) Update: Come to the ride Saturday, then to the Zoo Sunday! 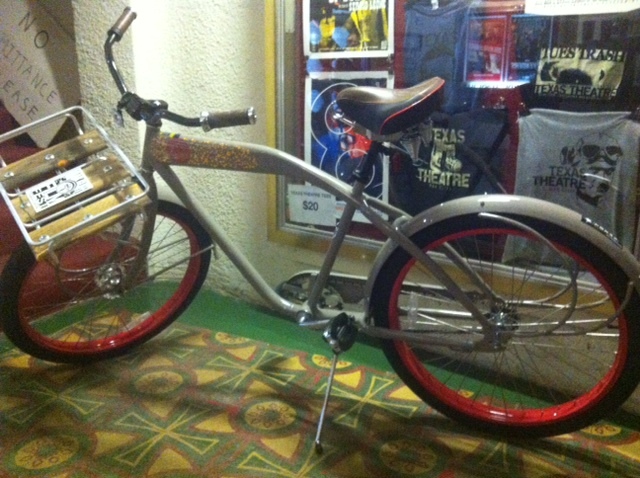 And, in addition to tasting New Belgium Brewery’s newest brew at Film Fest parties, you can enter the raffle to win the New Belgium BIKE! Yeah. Update: Everyone who comes to the Zoo’s showing of Fantastic Mr Fox gets a raffle ticket to win! It’ll be a full weekend of film fun and bicycle love. Get your film festival tickets at oakclifffilmfestival.com or get your cyclist discount badge here (use password f4iend50f0akclifffilmfest.) The Oswald ride, as always, is free and open to all ages.